It's possible you've heard of the band Say Anything by now. Their release "Alive With the Glory of Love" enjoyed some decent circulation on TV Shows and throughout video channels, such as FuseTV. "Wow, I Can Get Sexual Too" was an instant teenage sensation since it repeated the thrillingly provocative "called her on the phone and she touched herself" line, not to mention an appearance by Henry Winkler in the video. If you missed these, maybe you heard "Baby Girl, I'm A Blur" which did receive national airplay. "You don't think I'd say those words to you today?" This blog is being written because I want you to meet the Say Anything from before "...Is A Real Boy" or "In Defense of the Genre". You see, the band as a whole and their songs are very special to me and I am missing someone quite a bit right now. The day this blog goes live will hopefully be the day I get to see that person again. The way we had to go about discovering the band, tracking down early recordings, and what we went through to finally see them live makes it all the more important. 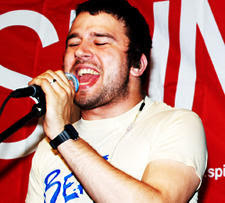 I never want to say you're mine "right now"
Max Bemis is the lead singer and songwriter of the band. He began penning tunes after a bad breakup in the year 2000, and fortunately for us, at least a hundred (and counting) articulately written songs about love, loss, society, school, the music scene, and hypocrisy followed. Unfortunately, Bemis' past decade has been full of ups and downs related to his mental disorder. At least one tour has been cancelled as a result of his paranoid delusions, quite possibly stemming from his decision to replace prescribed meds for Bipolar Disorder with illegal drugs. But a string of successful tours (currently on Warped Tour) and recordings have followed those harrowing times and Bemis and Co. are working on not only recording another Say Anything album, but several side projects with well-known industry pals as well. It's still difficult to find these earlier recordings on standard music purchase sites. But there is plenty to find on P2P sites. I suggest you check it out... Or purchase their new albums below. It didn't kill me to be shameless. Is anyone getting a toothache from this post yet? All this time... It's my favorite pastime, chasing after you.